Creating the perfect modern bathroom is something I know I dream about, so maybe it’s something you are hoping for too. But what is the ‘perfect’ bathroom and does such a thing really exist. I always say that your home is a reflection of your personality and as much as you want to inject new trends into your decor you should also never be a slave to them. Ensure you add your own flair and twists to a look no matter how much you are led by current trends, and the bathroom is no exception. Well what do we mean by a ‘modern’ bathroom to begin with? Modern often means clean, unfussy lines with minimal accessories focusing on function and from which can be quite easy to create in a bathroom. 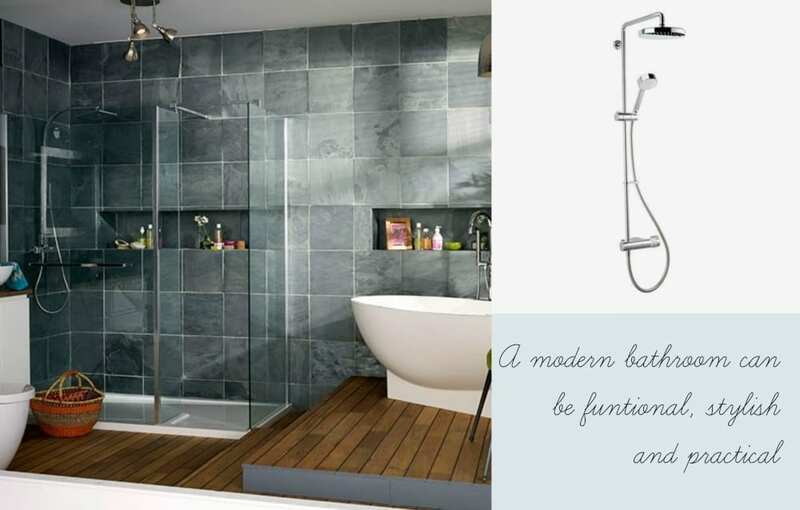 With such great products available on the market today it’s easy to put together a modern bathroom look. Take this next collage as inspiration featuring one of Mira Showers mixer showers which illustrates how we can create a modern look by using square edges and natural looking materials. There are some accessories and a splash of colour but the feel is very minimal and uncluttered. Shower head design can be very angular to reflect modern trends, which will work brilliantly well in both shower cubicles or over the bath. Mixed with round edged minimal style baths like the one in this shot, they can be very contemporary and sleek. I’m also a fan of mixer showers for their ability to create a fast flowing, adjustable temperature which, I know from experience is ideal for families and children in particular. If you like this look but wonder how you’ll create it in a family home read on. Can this look work for a modern family home, well I think you can with some clever storage. We all know that when we have children they come with bucket loads of paraphernalia and finding somewhere to put it all is never easy. But if you think about what storage requirements you have for your bathroom to begin with then it will all come together in the end. Conceal your storage ideas where you can to ensure you maintain those clean lines but I know not everything fits in a cupboard. And sometimes we need to have things on display or within easy reach anyway. 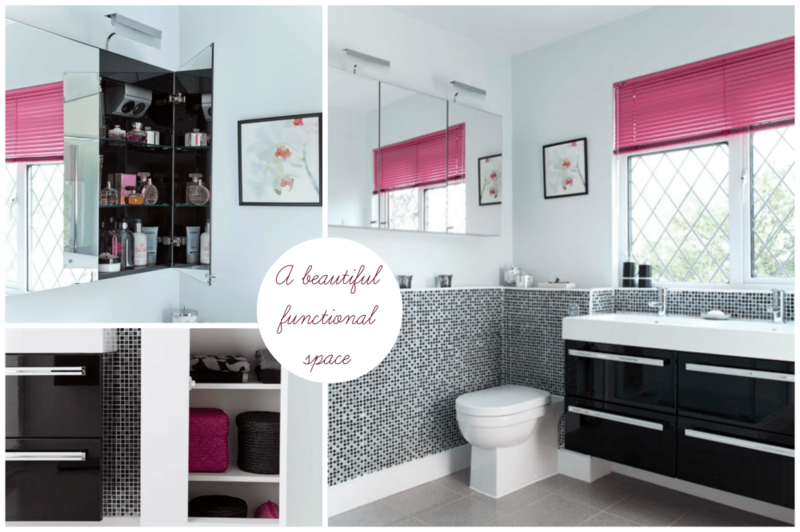 Do what you can to minimise clutter to ensure a modern bathroom look. So where do you go if you’re looking for inspiration for your perfect modern bathroom. Well of course, you can look in magazines, at blogs like this one, hunt around online, and research Pinterest. One place you may not have come across quite yet is Houzz which is a wonderful resource for finding home interior images to inspire you. It’s free to use and has a great search facility. You could even upload your own images once your makeover is complete! Another thing I love to do is look at real homes and real rooms to see how these things can look in real life. Sometimes they can be so different depending on the light and the space so ask your friends and family for a good nosey around their home. Becky from Family Budgeting did a lovely makeover on her bathroom earlier in the year and it was great to be able to see it in the flesh.